This note was posted on an RBC ATM on Wednesday. 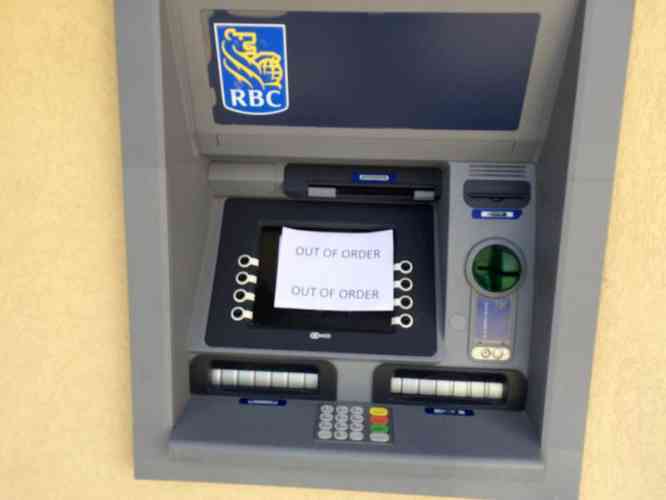 PHILIPSBURG–A service disruption that affected some RBC Royal Bank debit card transactions in St. Maarten on Wednesday has been resolved. RBC Senior Manager of Corporate Communications for the Dutch Caribbean Hanneke Stomp-Harmsen confirmed that there had been an issue on Wednesday which is now rectified. “I can confirm that there has been a service disruption today [Wednesday – Ed.] affecting some debit card transactions in St. Maarten. Clients may not have been able to make purchases on RBC point-of-sale devices or use our ATMs [automatic teller machines],” Stomp-Harmsen explained. “Our first priority was to resolve the issue. Our teams in Canada and the Caribbean have been working diligently to restore our services. We are currently looking into what caused this disruption to help determine how we can prevent it from happening again.